General commercial terms and conditions of the HOTEL RICHTR. The general commercial terms and conditions define relationships with persons or partners with whom no bilateral commercial agreement has been agreed upon. 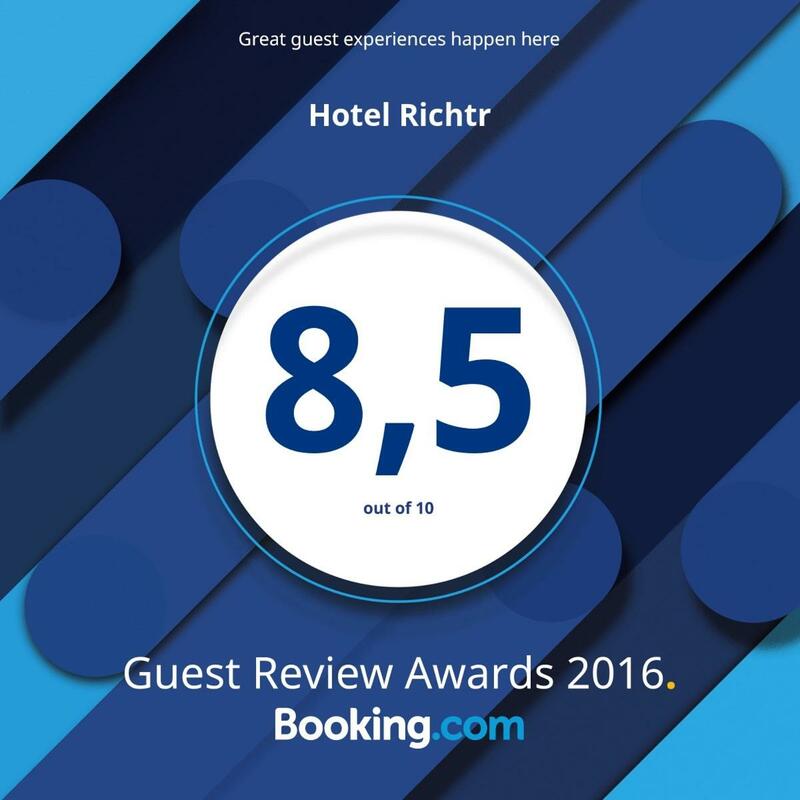 A room at the HOTEL RICHTR can only be booked in a written form (by mail, fax, e-mail, or by filling and sending a form available on websites. The room booking is deemed to be accepted by a written confirmation by the authorized person of the HOTEL RICHTR. Room booking and ordering can be accepted and confirmed also based on stating a valid Credit Card as guarantee. If services are not used, a fee shall be charged according to cancellation terms and conditions. On-line booking is binding. A breakdown in the booking confirmation is binding for a scope of contractually agreed upon services and prices. Mandatory booking means a commitment to book accommodation for the Tenant agreed number of accommodation places for the agreed term and a liability accommodated this reservation at the agreed time use, or pay the accommodation cancellation fee if you cancel your binding booking, or use them only partially. When a binding reservation for accommodation landlord may require advance deposit of 30 to 100% of total price. The landlord returns the deposit accommodated less the cancellation fee within 7 days after the Tenant written notice of cancellation of a binding reservation to the last day of an early termination of the stay. A price for the stay at the Hotel can be paid by a client at arrival either in cash or by Credit Card at the reception of the HOTEL RICHTR. We accept most frequently used Credit Card types (a list of Credit Cards that can be used for payment of stay at the Hotel is available at the reception and on websites of the HOTEL RICHTR). A price for the stay can be paid by the client prior to his/her arrival by a Bank transfer to the Bank account chosen by the HOTEL RICHTR. A confirmation of the stay payment by the Bank transfer should be presented at arrival at the reception of the Hotel. A price for the stay can be covered by a post money order received by the client at request together with the confirmation letter. Prices include fees (accommodation, spa, etc.) that are imposed in the amount defined in the commonly binding Public Notice issued by the appropriate municipal authority. Concluding the accommodation contract, the client acquires a right for common use of hired premises, accompanying facilities commonly available to guests without any special conditions, and common services. The client shall apply his/her rights in accordance with Hotel guidelines and/or regulations valid for guests (Hotel Rules). The client is entitled to claim shortages, if any, in the rendered services. The client is obliged to exercise a claim in due time, without any unreasonable delay, so that a remedy can be agreed upon at the respective place, if practicable. A claim exercised at a respective place enables immediate remedy, while a later presented claim provability, assessment objectivity, and its proper settlement, is more difficult. On a day of his/her departure, the client is obliged to pay the agreed upon price including potential other cost, if any, incurred due to special services required either by the client himself or by accompanying guests, including a statutory Value Added Tax. The client is liable to the lodging provider for any loss caused by the client or other persons using the Hotel services known to the client or according to his/her will. The lodging provider is entitled to provide the client or guests with adequate substitute accommodation (of the same quality) if acceptable for a contracting partner, especially provided the accommodation difference is negligible and objectively justified. Objectively justified is deemed to be a condition when the premise (premises) is (are) unusable, when currently lodged guests extend their stay, when excessive number of reservations was accepted, or any other important operation measures requiring such action. Substitute accommodation cost is at the account of the lodging provider. The lodging provider is entitled to charge its services anytime, or charge them continuously. The lodging provider is obliged to provide agreed upon services corresponding to its standard. In case of a premature departure, a cancellation fee in the amount of 100% from the remaining price, is charged. Purchased gift vouchers are non-refundable. They are only valid for a term determined in the voucher (1 year as maximum). Services offered at the HOTEL RICHTR facilities can vary during a year. The client is obliged to follow the up-to-date offer of services. The lodging provider provides no financial compensation for ordered and not drawn services, and for changes in ordered services during a stay (lodging, board, wellness services). General commercial terms and conditions enter into the effectiveness on 1. 8. 2012. Any amendments and additions hereto can only be agreed upon between and by the lodging provider and client exclusively in a written form. Personal data of the client presented in the stay order shall only be used by the lodging provider for a contractual relationships being concluded between the lodging provider and client.